The Ivy Plus Society (TIPS) invites LSE alumni and friends to join other Ivy-type business school alums to their Summer Wine Event in Santa Monica. 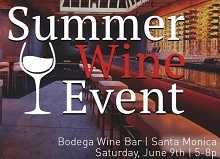 TIPS: Start your summer off with a nice pour of wine at one of Santa Monica’s staple spots, Bodega Wine Bar. Mix and mingle with young alumni and professionals over Bodega’s delicious happy hour, exclusive for our members. This fan favorite lounge will bring together the finest and brightest in tech, finance, entertainment, education, marketing, and more.